a lot of my peer group in school called me names for being left-handed. Actually, my teachers always made sure the lefties got a desk on the left. After secondary school, I never had a problem with having elbow room if I needed it as assigned seating was never required. Although to be honest I didn't ask because I didn't want to create a fuss. Always a pain and I was the one who was told off! Always. Now as a ex-teacher and now lecturer in Education I always point this out to student teachers on Teaching Practice! As a teacher myself, I take great care to ensure that 'knocking of elbows' does not occur and seat pupils accordingly. At my school, there were 5 left-handers and we all sat one behind the other at single desks on the right hand wall of the classroom. Our left elbows were then free to move over the left edge of the desk into the aisle. A neat solution. At the age of 12 we were allowed to choose our own place in the classroom. The one restriction our teacher gave was that 2 right-handers could sit together, and also a left-hander and a right-hander. The reason was of course that no one should disturb the other when writing. When we entered the classroom and choose our places I saw a left-handed friend sitting left of the desk, and I figured that it would be also ok if 2 left-handers sat together without having writing problems. So I took my seat next to him, at the right side of the desk ! When the teacher checked what his pupils had done, he passed my desk and saw a left-hander sitting at the right side of a desk. He couldn't see that 2 left-handers and 2 right-handers wouldn't have the bumping-problem and he criticised me loudly in front of all the other pupils. The fact that I tried to explain the analogy between the 2 right-handers positioning and the 2 left-handers positioning only made it worse. For the rest of the year he did pick me out for his practical jokes and mocking stuff. He was the worst teacher I had during school. At the college I go to they only have desks for the right handed, very hard to work that way. At university it was terrible as in some lecture theatres they had chairs with small desks attached which were made for right handed people, it was not possible to move the desk to the left hand side so my writing was often messy and awkward to do. Being left-handed is all about adapting to a right-handed world. To complain about or try to change everything that is a handicap for an individual as a lefty would be overwhelming. That said, in regards to the question "did your teacher let you move? ", the better question is, "did you bother to ask to move?". Personally it can sometimes just be easier to "submit" and roll with things than to (seemingly) always be making a deal about it. But teacher and child didn't realise it was a problem until a left handed teaching assistant pointed out it would be easier to move! Children should not remain with the same classmates all the time - they should be regularly mixed. Ever since I was little, and the only lefty in the family, I started sitting on the ends of tables and in a way not to bump those around me. So I started asking my teachers at a very young age to move me if I notices there was going to be a problem- especially in art classes. Every year I ask for Edward to seated next to another left-hander or on the correct side of the table for him. Often during lessons the children change places and he 'just has to make do'. As he's young he doesn't have the confidence to ask to change sides. I even have to remind his teacher who he's been with for 2 years that he's left-handed and needs to sit in certain positions. Generally didn't move just edged my elbow in a bit more. Got the message that left handed students were just an inconvenience. grade school wasn't the problem. when I got into high school and even college the desks are always on the right side of the chair. LH people have to hold there arms up while taking notes or it becomes very painful. I also hated sitting at a desk in high school that was made for right handers. There were only a couple of left handed ed desks and they were usually taken up by right handers who were not willing to move. I always sat next to my best friend who was right handed, we always sat in a certain position to avoid knocking elbows! I always took the second desk from the left and used the writing base for the righty who would have been to my left. 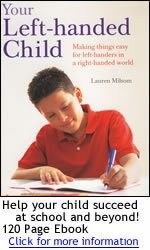 I am a teaching assistant as well as a student that has just carried out a research project on left-handers in my school- this was previously a problem for some of the children there. I am still in school and now I make sure to sit in a corner seat. When I was younger, I never thought to ask the teacher to move our seats. I am the teacher and often suggest children move if I see a problem. I as a rule learned to sit on the end of a table where my left arm was free. I constantly have to deal with this problem, and worse than the teacher not letting my switch, the right-handed person almost always blames me for being awkward and left-handed. i continually bump elbows but many times I do it on purpose and then say that they should convert so they will not bump me. I did have trouble - to the extent of having an elbow 'fight', in which I bit my classmate ! My mum had to come to the School and no action was taken but it didn't occur to any of us about moving. i did it just last night. We are 14 students and a teacher in a room designed to accommodate only 12 people! We sit at a large table, with a second table perpendicular to it at one end of the first table. I often find it more comfortable to write with the notebook in my lap because of this! I did, quite often. I still do, actually, but it's a bit easier to avoid it now, and the people I work with are aware of the problem and we seat accordingly. I don't remember asking permission. I don't remember ever asking to move. At the time I didn't really understand the impact it was having on me. I don't think I ever asked to move, but I am sure if I had asked my teachers would have let me do so. I felt there was no need to move and cause a big hassle, as elbows did not knock very often anyway. I get told to more to the end of my desk which doesn't help much. I had to make sure, when allowed to choose a desk, that I was on the left of the next person on the end of a row. i hate it when that happens at restaurants - righties never understand! I have knocked elbows with right-hander, but it never was an issue. I have to live with it!! I've learnt to get used to it. I Just hate It when I'm doing class work and I hit other peoples elbow so we have to move apart. I make it a point to ask students if they have problems like this. I teach science and they sit two to a lab table, it is an easy fix. I never asked to move, but most teachers were sensitive to left-handed students. I never asked to move. I never asked! I just moved my arm. I never thought of asking to move in primary but at high school and the university I would always have to rush to get a "left-handed" seat in the labs and lecture theatres (if any was available, that is). The other thing that would save me was if I got a seat right at the wall (left side). I often knocked elbows with right-handed students...most teachers were understanding and would let me move, but others wouldn't care. Now I much more aware of what side of a pair of desks I sit on. I spent my school life thinking I was in the wrong! I consciously put a left-hander on the end of a table to that the arm is free to move. I tried to sit on the left of a right hander but that wasn't always possible. I still do now especially when eating out. I used to knock elbows with my classmate and the teacher let me move. The problem was that I sat at the aisle and everyone passing by knocked me the same. It was really annoying. I usually grab the left sides of tables to avoid knocking elbows. Back in elementary I'd try to not take up too much space of the desk in order to avoid getting hit because sometimes a right-hander would knock me while I was writing. I was a very shy child though so I usually tried to adjust myself in order to accommodate others. This caused my handwriting to suffer for a while, but as I grew older, it got better. I was always in schools where each student had a separate desk. I was educated in Modesto California, and they were very progressive. I never had any kind of interference from teachers. I was fortunate to never have had this experience at school, although sitting at the table at home was sometimes another matter! I was lucky, my parents were great at supporting me, & the teachers had to back down when thing got heavy. I was only moved after requesting to be moved. Since then when ever I get to choose my own seat I always sit on the left side or next to a friend who's left handed also. i was quite lucky as my best friend is left handed so it was not really that much of a problem. I was raised to sit in the lefty corner(s). One of the neat things about working in Information Technology is that there are a LOT of lefties. The last time I tried to sit in the lefty seat, it didn't matter -- two of the others at the table were also lefty! I was told to move my elbows in to stop annoying the others - even though the right handers were allowed as much space as they liked. I went to two great schools, where we had separate desks. In grade school I was not allowed to change my seat. When I attended college I had to ask to change my seat where I had more of an opportunity to locate myself where I didn't knock into anyone. However the chairs with desks for left handers were seldom available and taking notes were often done on my lap. in primary school they would sit left handers together, that was the only time. In secondary school, I became aware of knocking elbows with righties so always asked which hand the other person wrote with before deciding on which side to sit. it was sooooo annoying I couldn't concentrate. At all!!! Junior schools were more amenable. Secondary school insisted we sat in register order. Left handed desks were not available; I had more of a problem finding a right handed desk so I could sit at an angle to see the board and the teacher. Left-hand desks did not exist when I was in high-school. Maybe it happened a couple of times, but never really a big problem. Most teachers are nice about it and they will let you move. But there are a few teachers who seem to care more about you sticking to their seating plan. My 9th grade biology teacher was the only teacher I've ever met who asked, "Are you left-handed?" and then proceeded to move me to a more comfortable seat where I would not knock elbows with the right-hander next to me. My daughter is also left handed and is now nearly 7. I have made great efforts to point out the problems to her teacher who actually asked me to come in one day and show her how I hold a pencil! My hand gets more tired quickly because there are absolutely NO left-handed desks at my school. I feel fortunate when I find desks with both sides supported. My teacher did not move me;she moved that person and put another left-handed person there. My teacher put all the lefties together so that we didn't hit hands. My Teacher was left handed so she understood that it was annoying! my teachers in elementary school were very strict about where you would sit because my class was full of students who were not well behaved. It hurt..now I have problems with that arm..and back from sitting in an awkward position for so long. My teachers told me to keep my elbows off the desk and stop interfering with my desk mate. My teachers tried to have me write with my right hand. I had an art teacher who wanted to tie my left hand down so I wouldn't use it. Not that I was made aware of. Nothing was ever done in regards to this problem, as my formers teachers never understood. one teacher in particular was useless when understanding being left handed; it knocked my confidence greatly. One teacher specifically sat the *entire* class correctly so lefties and righties didn't knock elbows! Only once had a problem with right-hander. That was on an aircraft with the offender being an American who couldn't use a knife and fork properly. our teachers attitudes in Ireland was "tough, learn to deal with it"
Quick story, sit side to side with a right handed person on your right. You can now hold hands under the table while you eat. Same thing at meal times too with a tussle of knife wielding arms! Sitting a left handed child to the left of a right hander when eating also relieves many stressful mealtimes! Sitting on the right of a right handed person can be really annoying and they can get really annoyed. This is really bad, particularly if the person next to you is a really fit girl. Some teachers ask if anyone is left-handed and they move them right away at the beginning of the class. It makes me feel like a have a problem and I have to sit in a certain place. some teachers have, but when in a seating plan I have been unable to. Some would let me move, others wouldn't. Sometimes at multi-person tables if we were close enough we would bump elbows and the right-hander always blamed the left-hander for it. I had to request left-handed single-seat desks in some classes in school as it was difficult to write on the right-hander desks because my elbow could not rest on the desk as the right-handers could causing fatigue. Some teachers were not wanting to have a stray desk in the room or had to steal it from another room which meant another left-hander was possibly having to put up with a "backwards" desk. Sometimes I tried switching hands, but that didn't work well. I ended up not getting the notes taken because I was writing so slow with my right hand. Sometimes I was able to move but most times, I was not. Sometimes teachers let you move, but other teachers think you are just complaining. Sometimes they let me move. Teacher was happy 'to keep the peace'. Teachers did move me or Special Educational Needs teachers noticed and would recommend that I sit on the left hand side of the desk. Teachers never paid attention to where left-handed students sat. Teachers rarely recognised this problem. that really got me angry, the teacher wouldn't let me move because there were no other leftys in the class so I had to sit crunched up. The desks were made only for right handers. the only other left hander is my teacher and my friend brandon and he's in the other class. The placing of pupils always seemed to be random. The right handers got really annoyed so I asked the teachers if I could move and of course they kindly allowed me to. the school desks were made for right-handed people..the desk top was a small rectangle with a straight armrest on the right side so we left-handed students had nothing to rest our arm on while writing. The School tired to make me write right-handed for years. Every time I reverted, I was told off for being "stubborn"
the schools in my city are so overcrowded, your lucky if you even get a desk. they have to sit us so close together, I've knocked elbows in every class. The teacher sometimes let me move, sometimes not. The thing that annoys me the most is that ALL of the desks in our school are made for righties. It is very aggravating that they cannot make even five desks for the lefties in our class. There is enough room between students so this isn't a problem. They acted like they could "cure" my left handedness by making me and the other kid as uncomfortable as possible. they tend to sit left handers together. there is an unusually large proportion of left handers in my year group. This always happened in primary school - one of my teachers called it "elbow wars". I remember to sit on the left side of the table now!! This hasn't really happened that much, but whenever it has my teacher would let me move, or at least to scoot over so we don't hit each other. This is a big problem to this day. I always have to make sure I set in a position so I don't hit elbows. This was a battle I had throughout secondary school in particular, especially when we'd been put in boy-girl seating plans and teachers were reluctant to allow us to move. The one teacher who was willing to let me swap was left handed, so understood the situation. This was always a problem for me. In the end I didn't ask the teacher to move me, we just switched places. Though, I don't remember asking either, we just moved around till everyone fit. Usually sat at a desk for one. However the desk was located on the wrong side, causing problems with writing, etc. There were no other choices of desks. Was always put on the right hand side of the desk so that my right handed partner couldn't copy from me and vice versa. We only sat at single person desks. We would often swap seats as we had forgotten that we needed to sit the other way around to allow us both to write properly! Well, I've knocked elbows plenty of times, but it was never a problem enough to move. And if it was, I'm sure my teachers would have let me move. When going out to eat that has happened to me. When I was a child in elementary school (years ago)I constantly had a difficult time being left handed with teachers who did not approve of my mother's choice to allow me to stay left handed. when in restaurants and such - make sure that I'm sending on the left end or have someone left handed sitting next to me. While writing a practice essay for an AP exam, we all sat at the back of the room along the wall. I had to squeeze my arm into a somewhat comfortable position. With regard to sitting next to a right handed person, I don't think it ever occurred to us to ask the teacher if we could move places so that we could write freely. But having been on the left hand side of a desk as well, I have noticed that my left arm will ache if it is left to hang over the edge of the desk when I start writing on a new line! I think I actually preferred being on the right hand side of a desk for this reason, even though it did sometimes cause conflict.